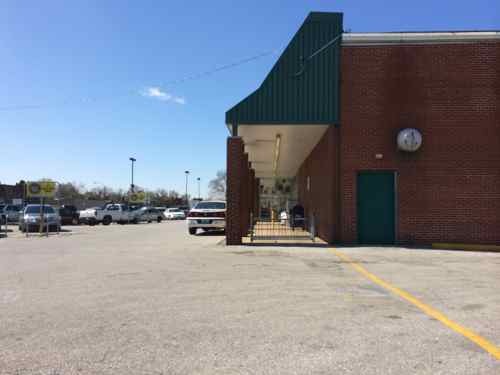 Next month, the region’s leading grocer will have only one store in the city north of Delmar Boulevard. 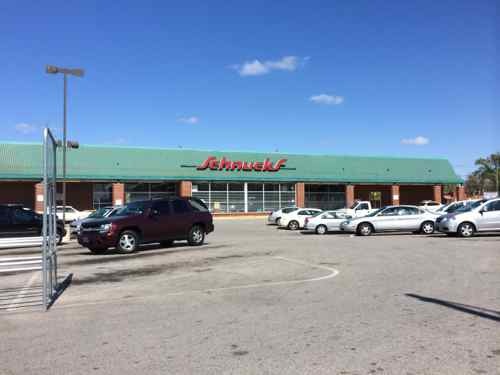 ST. LOUIS – Leaders of Schnuck Markets, Inc. today announced they will not renew the lease on the Grand and Kossuth Store (4127 N. Grand, 63107) in north St. Louis. The store will close permanently at 6 p.m. on Saturday, May 10. No jobs will be lost; all 65 teammates will be transferred to nearby Schnucks stores. 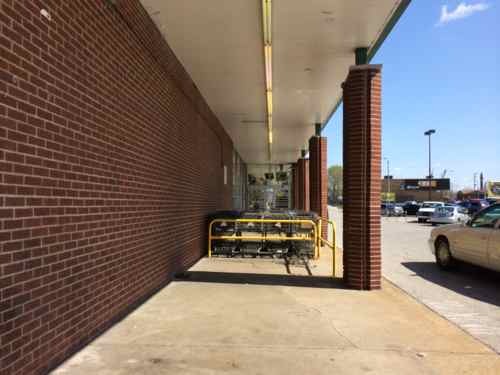 Schnuck says that should the landlord entice another grocer to the site, Schnucks would leave the majority of the store’s fixtures in place. In the meantime, the company will start a sell down of goods prior to the May 10 close. 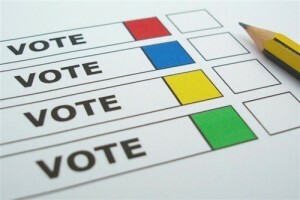 Pharmacy customers may continue to have their prescriptions filled through May 10. Additional information will be provided prior to the close. Founded in St. Louis in 1939, Schnuck Markets, Inc. operates 101 stores (including Grand and Kossuth) and 95 in-store pharmacies in Missouri, Illinois, Indiana, Wisconsin and Iowa. I’d been by this store numerous times, when it was a National I lived not far away in Old North St. Louis, but I’d never been inside. So the day after the announcement I boarded the #41 MetroBus, which stops on Kossuth right next to the store property. Between downtown (14th & Washington) and the Schnucks a couple of passengers boarded the bus that got off at the Kossuth & Grand stop to do their grocery shopping. Let’s take a critical look at this store to see why they couldn’t attract new customers. 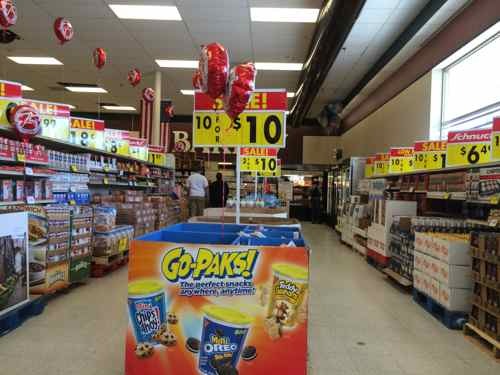 Immediately you get the idea this Schnucks wants to be an ALDI or Save-A-Lot. 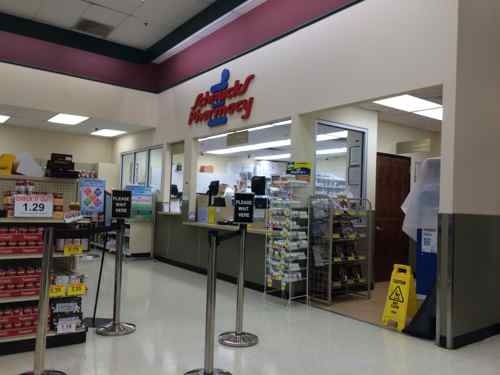 The pharmacy that was recently added or updated. 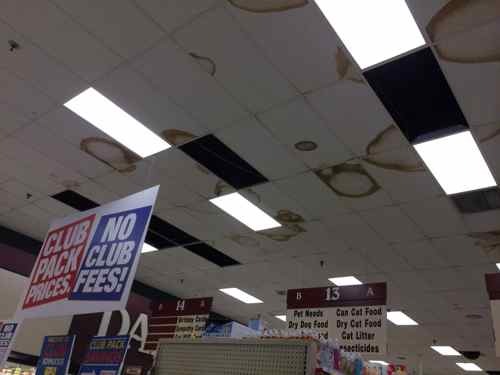 Throughout the store ceiling times were missing or water stained. Now you’ve seen the store, inside and out. Think anyone goes out of their way to shop here? Nope! Anyone pass other grocery stores on the way home from work shop here? Nope! 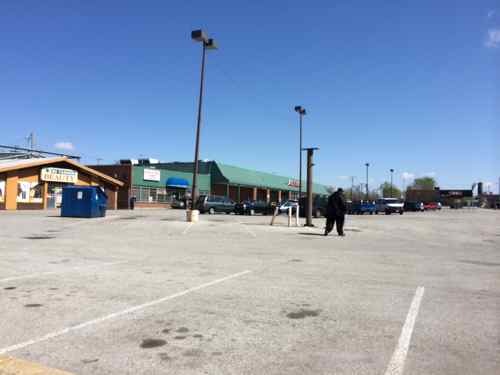 Those who live near this Schnucks likely shop elsewhere if they have a car or access to another bus route. An ALDI is located just the other side of Fairgrounds Park, it was built in 1999, the Schnucks was built in 1968. Those who use the #70 route can just as easily go to the much nicer ALDI. Those who drive likely pass other grocery stores on the drive home from work, so they have nicer options. I worked at Union near I-70 when the Schnucks at Union & Natural Bridge opened in 1998, I’d go by sometimes at lunch to get a salad. 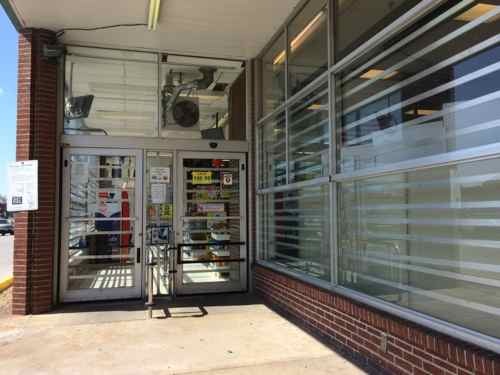 The Kossuth Schnucks lacks profitable departments like salad/olive bars, deli, prepared foods, floral, etc. The store is only 28,000 sq ft, about half of most newer Schnucks, but larger than the 21,000 sq ft Culinaria store downtown that has all those departments. A ALDIs doesn’t have prepared foods, floral, etc and manage with 17,000 sq ft stores, but their model is very different from Schnucks. And hours is another big difference. The Schnucks at Union & Natural Bridge is open, like many Schnucks, from 6am-midnight every day. This allows customers to shop before or after work. The Kossuth store hours have been “Mon-Sat 7am-9pm, Sun 8am-8pm” which means many can’t shop there even if they wanted to. Is Schnucks the bad guy here? For the most part, no. 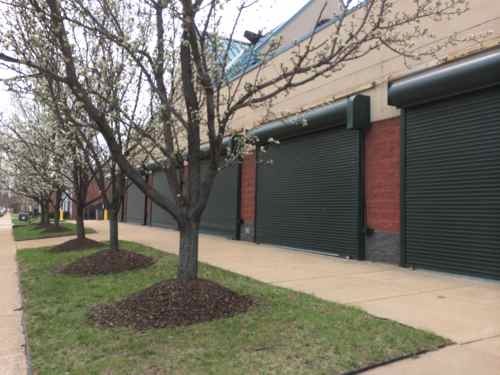 Schnucks doesn’t own the property, they’re a tenant. The North Grand building is owned by Marvin Holdings LLC, which lists Mishaal Taqui as its organizer. It acquired the building in the fourth quarter of 2013 and offered to do about $100,000 in roof repairs, said Taqui’s spokesman, Glenn Jamboretz. 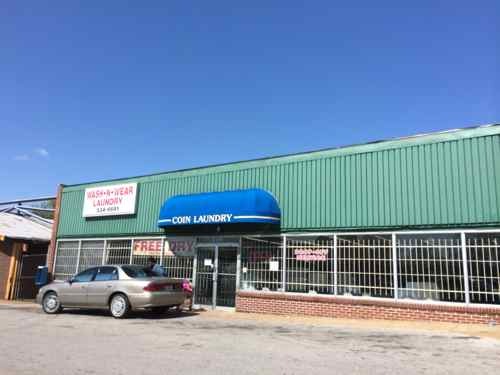 Taqui wanted a multiyear lease from the retailer and a small rent increase to offset the cost of the repairs. It had been renting the building year-to-year for about $6,100 a month, Jamboretz said. A sales incentive clause sometimes bumped that monthly payment up to around $6,500. The closure of this store will leave a void on the market, the Schnucks carries products the nearby ALDI simply doesn’t stock. Those who get their prescriptions here will need to find another pharmacy, perhaps the Schnucks at Union & Natural Bridge. I can imagine some who are transit-dependant moving closer to another grocery store or a different bus line. The landlord will need to do lots of work to attract a quality store, even then it doesn’t seem likely. 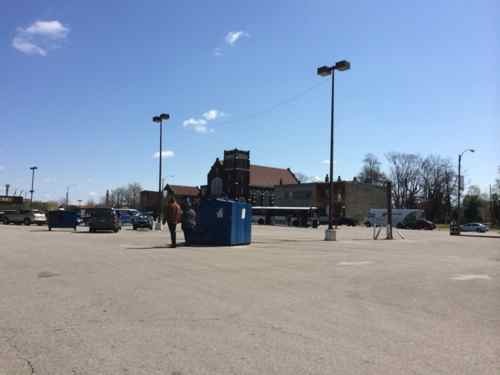 The site is ideal for a 3-5 story urban building with 100,000 sq ft of ground floor retail, much of which could be a grocery store. 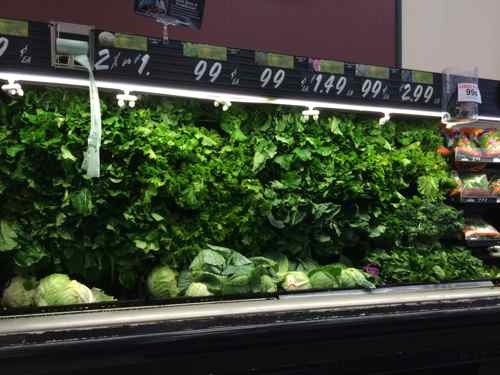 I’d like to see local upstart Fields Foods consider such a store. 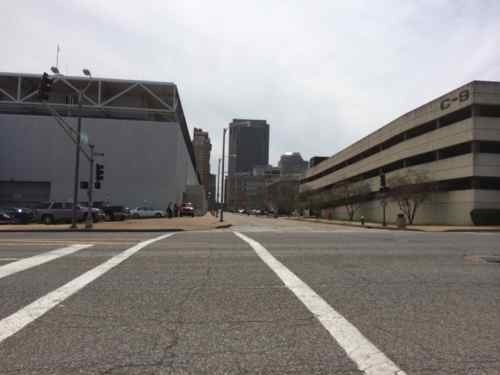 Decades ago traffic engineers converted many downtown St. Louis streets from two-way traffic to one-way traffic, 9th & 10th going north & south, respectively. The 9th/10th couplet extended north to I-70, basically serving as very long on/off ramps, cutting through the Columbus Square neighborhood. Today the former Cochran Gardens high-rise public housing project is gone, replaced with mixed income apartments. 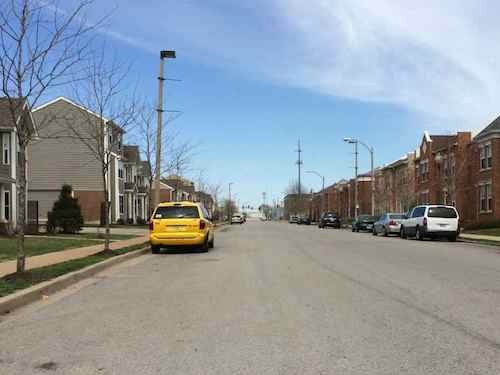 The 1980s Columbus Square condos and townhouses are still nice, the neighborhood is generally pleasant and safe. 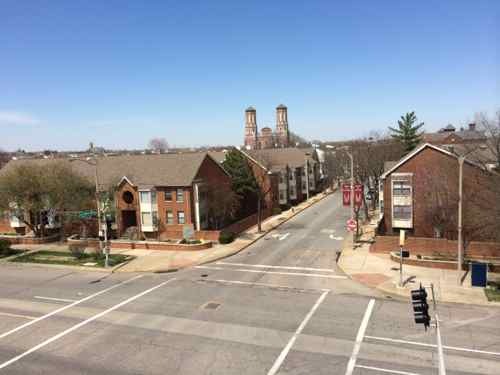 Despite the fact that 9th & 10th are no longer connected to I-70, they remain very wide one-way streets, undermining the positive investment in the area. 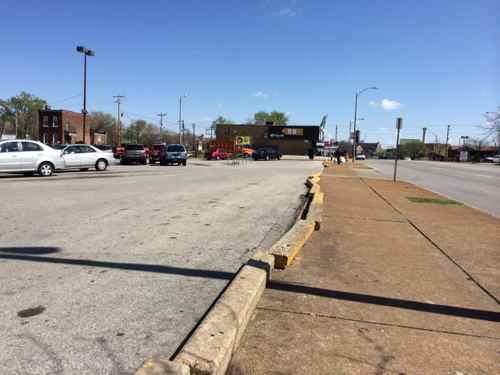 The St. Louis Housing Authority owns this retail building on 9th at Cass, one-way streets as a freeway on ramp aren’t good for neighborhood retail businesses. 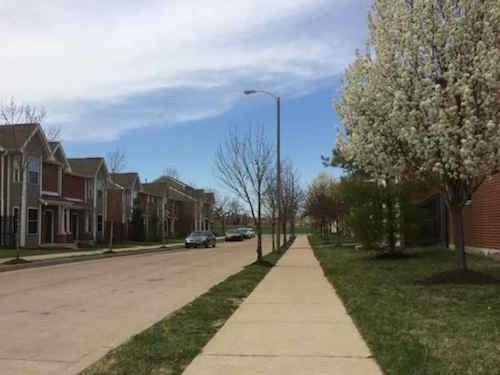 Most streets perpendicular to 9th/10th have a nice neighborhood scale. This is New Haven Ct.
I’d like to see 9th & 10th be two-way all the way through downtown, but that’s more complicated with garage entrances/exits. signals, etc. But from Cole St. to Cass Ave it would be very simple, just some changes to the signals at Cole & Cass, the rest is signs and paint. 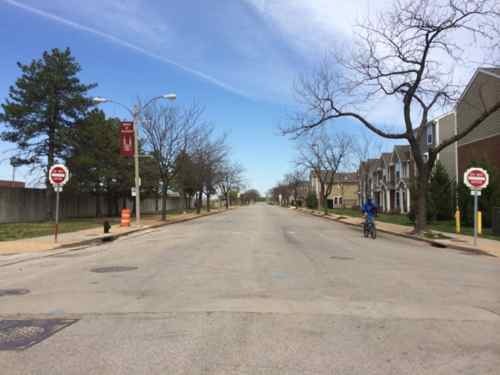 We ran these long on/off ramps through this neighborhood for decades, now we need to do the right thing and make 9th & 10th neighborhood streets again! In September readers picked the I-64 BRT route between downtown and Chesterfield as their favorite of four bus rapid transit (BRT) routes being studied by the Transportation Corridor Improvement Group (TCIG), which “consists of staff from Metro, EWGCOG, the City of St. Louis, St. Louis County, and MoDOT”. 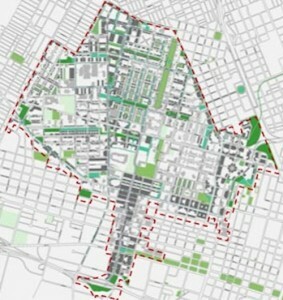 After careful consideration and analysis of the transportation corridors, the TCIG recommended as the locally-preferred alternative two BRT projects: I-64 between Chesterfield and Downtown St. Louis, and a north-south route connecting North St. Louis County to Downtown St. Louis primarily via West Florissant Avenue and Natural Bridge Avenue. 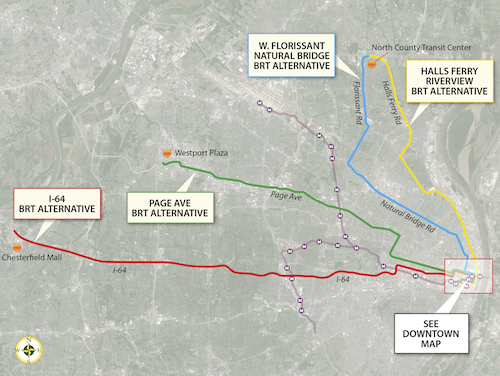 The four alternative BRT routes that were being studied, click image to view larger version. This route makes a lot of sense to me. It gets a higher level of transit service on this corridor without the enormous infrastructure expense that would be required for light rail. 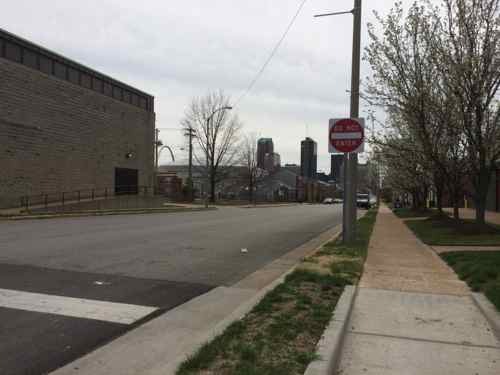 It would run down Forest Park Ave & Boyle, running right past the proposed IKEA and connecting with the proposed new CORTEX MetroLink station. Transit time would be reduced from three times driving to twice driving. For some that’s still a non-starter, but for others it would allow them to avoid driving/parking headaches while being able to be productive. It doesn’t need to get every driver out of their cars to be a success. Unlike going to Chesterfield, reaching downtown from North St. Louis County isn’t very direct via car or transit. This will help reduce travel time for existing transit users and is expected to attract new riders. The streetscape improvements along the route will benefit everyone in the area. Additional operational revenue would be necessary for this additional service. Metro’s board is expected to vote to approve these two locally preferred routes at their March 28th meeting. 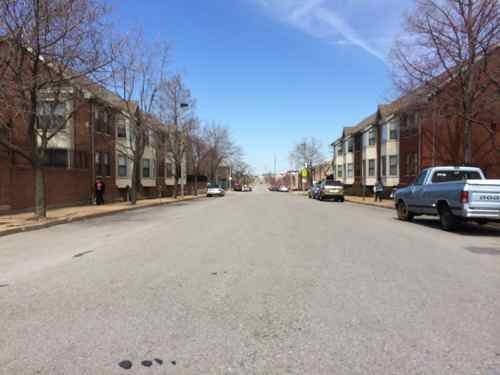 If approved it goes to East-West Gateway Council of Governments, the Metropolitan Planning Organization (MPO) for the St. Louis region. Once part of our 2040 transportation plan we can seek capital funding through the Federal Transit Administration’s Small Starts program. Again, much more detail is with the report/presentation from Tuesday.